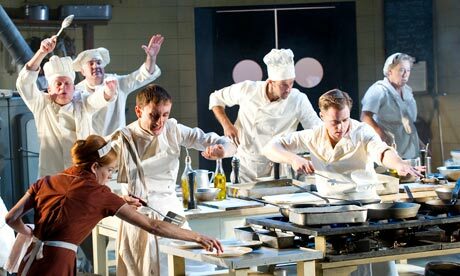 The frenetic, chaotic and, at times, balletic goings-on in a busy London- based kitchen is well realised in a revival of Arnold Wesker’s The Kitchen, currently being staged at the Olivier theatre. Wesker’s play, originally performed in 1959 at the Royal Court, is directed by Bijan Sheibani and the Olivier’s vast stage is maximised with meticulous detail to the typical bustling late 50’s kitchen aesthetic. The actors utilise the naturalistic milieu with grace and verve as I observed with delight the brilliant stagecraft as even the gas hobs on the ovens were fully functional. The play is set within one day and has a plethora of characters that are touched upon in small but rich detail. The central focus is on the mercurial Peter, played with Teutonic swagger, by the excellent Tom Brooke, who was last seen in the acclaimed recent production of I Am the Wind at the Young Vic. Peter is having an illicit affair with Monique, a waitress; and has aspirations to settle down with her, but owing to his belligerent nature, finds himself arguing with her and his colleagues on more than one occasion. The play is rich in themes and ideas that, although performed more than 50 years ago, still remain salient to this day, which is perhaps the purpose of its well-timed revival. The themes, which include racial tensions, the pursuit of love and how a mechanized and habitual way of being is destructive to your imagination and dreams, are conveyed calculatedly within this busy setting. Peter is ultimately the fulcrum of the production, becoming increasingly more capricious as the play progresses and you learn the source of his discontent. There’s a wonderful scene after the chaotic lunch service, when Peter implores his peers to speak of their dreams and they all seem to struggle to respond, numbed by the cruel machinations of their current occupational predicament and unwillingness to play. The beautifully choreographed scenes during the first half when lunch is served explore with humour and wonderful theatricality, the rhythmic and maddening chaos that occurs within the kitchen. The boss, Marango, enters during this time and acts as the conductor of his bevy of culinary craftsmen, waitresses and washers as they waltz their way around the kitchen. The pace of the production does seem to slow in the second half as you join the characters in a moment of peace and reflection after the chaos of lunch. This production is wonderfully served and at £12 for a ticket, is highly recommended.